i made this quite awhile ago, but thought i would post because everyone gets such a kick out of it. a couple years ago, i wanted to make a reusable grocery tote. i wasn’t finding any patterns that were the dimensions i wanted, so i decided to make up my own pattern. it’s not perfect, but it does the job, and we’ve used it for groceries ever since. last christmas, we got addicted to the game settlers of catan. i bought the base game for mike for his birthday, and then we bought the traders and barbarians expansion, and then the 5-6 player extension for each…and then the seafarers expansion…and the seafarers extension…you get the idea. it’s a fun game and we always bring it on trips, and we’ve also brought it to game nights or friends’ places for get togethers, and early on, mike realized the grocery bag was just about the perfect size for the game. this christmas, we got the final expansion and extension, cities and knights, to complete the game series. we thought for sure the bag would no longer work, but everything can *just* barely fit inside. however, mike also got a similar-themed game called carcassone for christmas, and it was really a tight squeeze. i added a makeshift pocket to the outside of the bag that fits two expansions or can just barely fit carcassone (i messed up the dimensions a bit). if they come out with any new expansions, though, i think it will be time to make a new bag (or, more realistically, stop lugging every single expansion everywhere we go)! 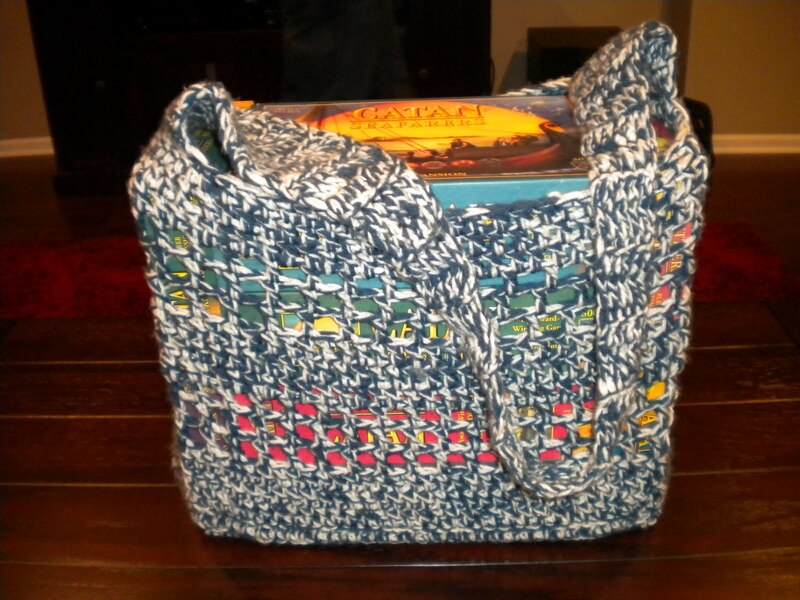 This entry was posted in Crochet and tagged bag, crochet. Bookmark the permalink.